ONGOING protest action by judiciary workers saw them holding a prayer session in front of San Fernando High Court yesterday morning. But the action did not go down well with members of the public, who demanded over-the-counter service and cashiers. At about 9 am, when court usually starts before judges and magistrates, the workers walked off their respective posts, and assembled across the road in the termite- and pigeon-infested magistrates' court building, which is earmarked for demolition. The judiciary is reportedly restructing its workforce so that those who are temporary, are to be reverted to the service commission for further employment outside the judiciary. Permanent judiciary staff may suffer the same fate. The judiciary is currently engaged in filling specialist posts as it restructures the administration of justice. For example, a Criminal Division Help Desk has been created. An internal judiciary memo circulated on Friday says an outreach team will be assessing employees' needs in order to treat adequately with the current transformation. The memo says, "As we navigate the changes in the coming days, we will be providing the staff with the relevant information which will be made available through the Help Desk Support Services." At the traffic court in Medina Building, San Fernando, people stood in line to pay traffic tickets, fines, child maintenance and collect child support. Suddenly, people were heard commenting loudly that the cashier had suddenly disappeared. She had left to join her colleagues in prayers. 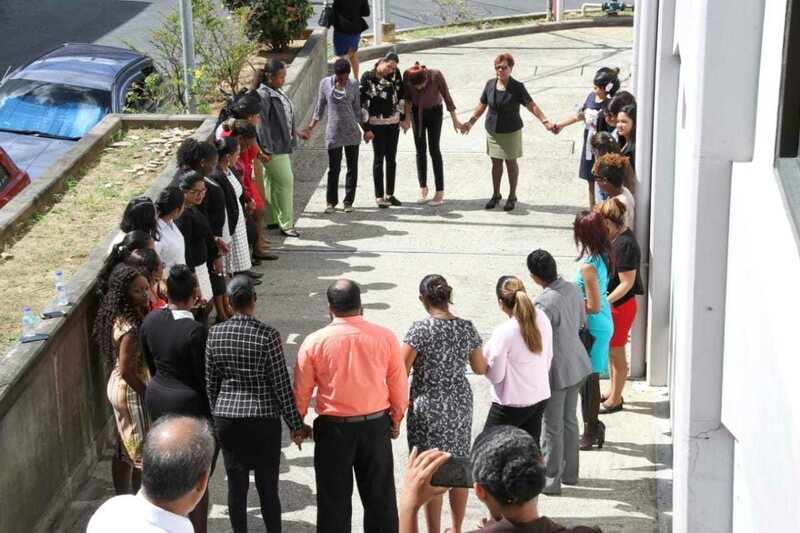 In front of the High Court building, as attorneys and litigants made their way up the court steps, the staff, mostly women, formed a circle and bent their heads, then prayed for divine intervention. Similar action was held in front of the magistrates' courts at Siparia, Couva, Chaguanas and Tunapuna. Reply to "Judiciary staff protest with prayers"